One of the problems frequently found in wind farm project and construction is that road bends with a reduced radius often needs an additional widening to allow the passage of the trucks with the WTGs components. Normally the biggest problems come with the blades. I suggest using a commercial software such as AutoTURN to estimate the actual additional road widening needed, because the tables provided by wind turbine manufacturers are almost invariably inaccurate and often based on wrong hypothesis. Angle between entry and exit tangent of the bend: the lesser the angle, the bigger the widening. Bend radius: smaller radii means greater widening. Type of vehicle (number of wheels, center of turning circle, dimensions). 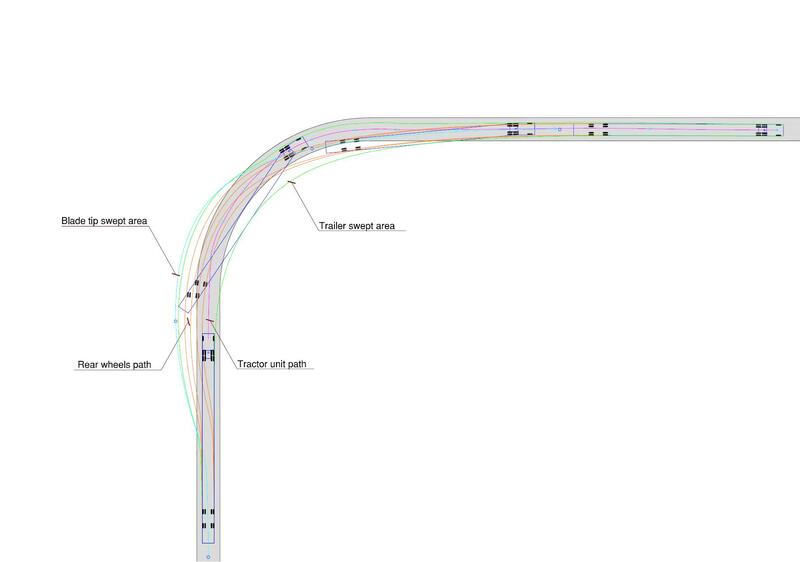 Different possible trajectories chosen by the driver. Use of real wheels independent control. 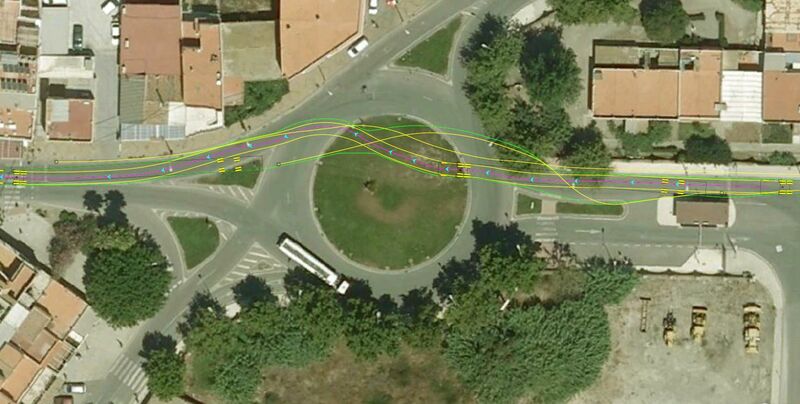 Simulating software are great because they use real word data: the trucks are equipped with GPS equipment and the movements of the vehicle is registered and transformed in an algorithm that allow to replicate it in your AutoCAD project, with realistic results and cost effective solutions. 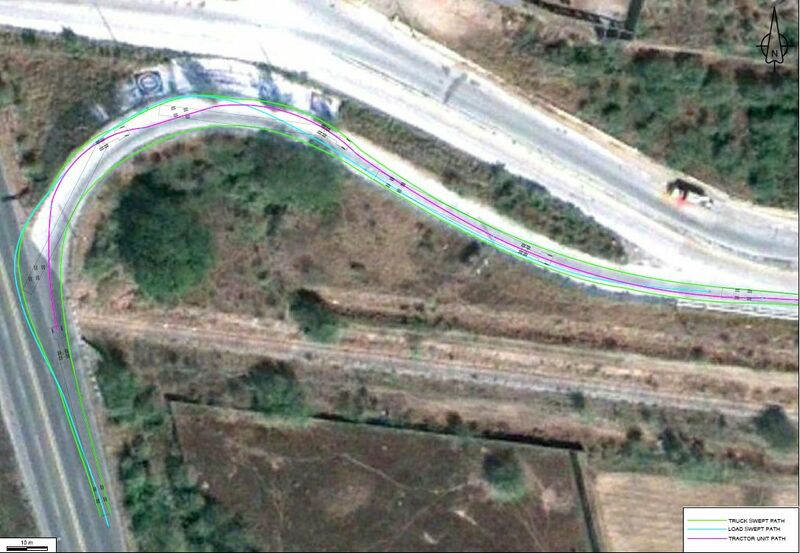 In the next image the trajectory of the different components of the truck in a bend with reduced radius are detailed. 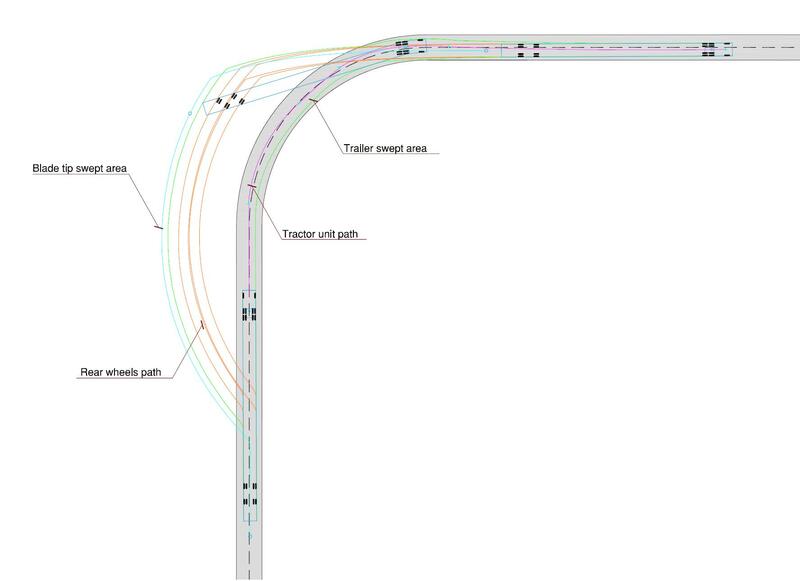 If the tractor unit follows a path in the center of the road, the rear wheels (orange lines in the drawings) will need an additional road widening both before the beginning of the bend and inside the bend. 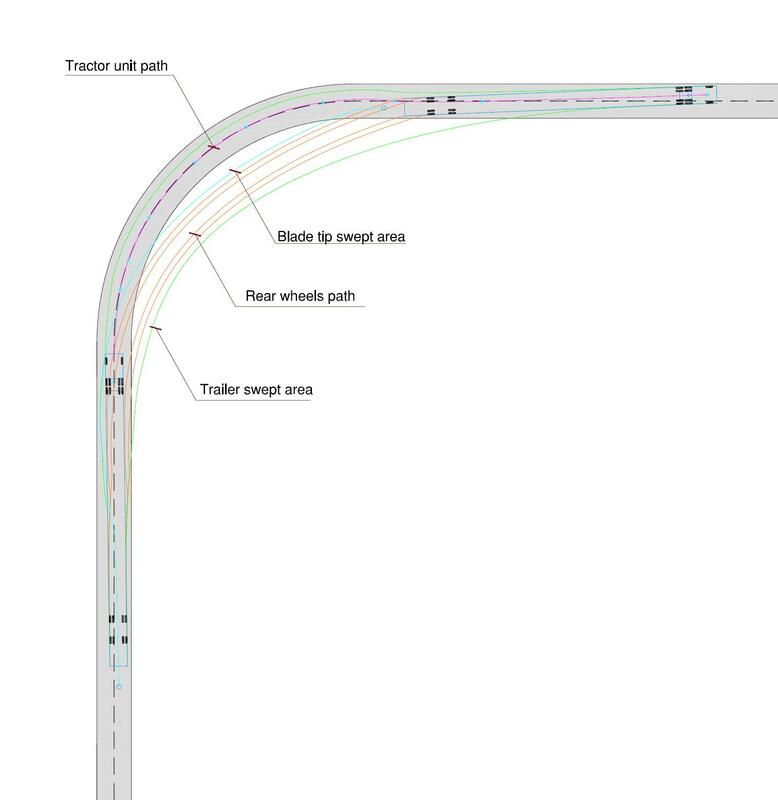 It will also be necessary to clear an area appropriate for the transit of the blade tip (outside the bend, cyan line in the drawing) and for the truck body (inside the bend, green line in the drawing). It is also noteworthy that most of the trailers for WTGs components transportation allow orientating rear wheels independently from guiding front wheels. For this reason, the road widening can be completely internal to the bend (using the steering control of the rear wheels) or external, sweeping the area outside the bend. These solutions are normally more demanding in term of additional required area. They are used in situation where, due to existing constraints (buildings, structures, property boundaries, etc.) the standard widening cannot be used and a solution only inside or outside the bend must be found. Figure 2: Wind farm internal road bend. Widening only in the interior. This is a non standard solution, and as you can see it needs more space. Figure 3: Wind farm internal road bend. Widening only in the exterior side. This solution needs an enormous amount of space, and we use it only in exceptional situations.